Crowland Under 14s are pictured before their 4-2 Junior Alliance League win over Netherton Hawks. 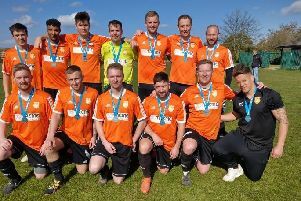 From the left are, back, Ewan Hoyles, Jack Wortley, Matas Jurkstas, Ethan Crolley-Waine, Kyle Santoro, George Henning, Joseph Humphrey, front, Ethan Withers, Louis Carr, Tyler Wortley, Charlie Nicholls and Christian D'Souza. It was a super Sunday for Junior Alliance League sides involved in the fourth round of the Under 14 Lincolnshire Cup. Three of the four teams in action advanced to the quarter-finals and that was a particularly fine achievement for Deeping Rangers Under 13s. Pictured are Netherton Hawks Under 14s before their 4-2 defeat by Crowland. From the left are, back, Joe Davey, Ruben Conceicao, Mahmood Abouelkhir, Saaim Khan, Khalil Trabelsi, Adam Lock, Amer Sharara, front, Kashif Mustafa, Ubaydullah Adil, Tyler Thurlby, Amani Hassan, Waliulhaq Hamidi and Muthassar Basharat . Playing against boys a year older, they won 2-1 against Bourne Town Red thanks to goals by Archie Rickards and Finlay Henderson. Holbeach Yellow made it through by beating Cleethorpes Town 5-1 while Spalding Blue edged past Barrowby 4-3 after extra-time. Jack Cunnington (2), Luke Fox, James Clark and Ethan Kemball were the Holbeach scorers while Alfie Anderson, Corey Compton, Daniel Plant and Thomas Taylor netted for Spalding. At least one Junior Alliance League side will be in the semi-finals as Spalding Blue will play Holbeach Yellow in the quarter-finals. Deeping’s young guns have been drawn away to Lincoln-based St Helens and the games are on March 5. In Under 14 league action, Thurlby Tigers have gone three points clear at the top of Division Three. They thumped March Park Rangers 9-1 on Sunday with Sean Bedford and Matthew Wright both firing trebles and Harry Lesiw bagging a brace. Wisbech Town Acorns have moved up to third following their 8-1 win against Stanground Sports. Josh Williams led the rout with four goals. Once again there were goals galore in Division Four. Leading the way were Stamford Yellow, who put 17 past Parkside Athletic wthout reply. Ryan McGreevy topped their scoresheet with six goals followed by William Wells and Jack Young with hat-tricks and Finlay Sewell and Sidney Bailey with doubles. Whittlesey beat Spalding White 9-2 thanks to goals by Jacob Burley-Muffett (3), Brandon Westgarth (2), Jake Redhead (2), Scott Ashkettle and Zack Reed, while table-topping Crowland were 4-2 winners at Netherton Hawks courtesy of strikes by Tyler Wortley (2), Jack Wortley and Charlie Nicholls. In the Under 12 age group, the biggest winners were Feeder Soccer in Division One. They roared to a 12-1 win over One Touch Football with George Dann (4) doing most of the damage. The rest of the goals came from Macy Jackson (2), Zack Reed (2), Louis Peters, Shay Markham, Louis Meadows and Bobby Dixon. Under 12 Division Two leaders Park Farm Pumas Red made it 14 games unbeaten when seeing off Holbeach Yellow 6-0 with Keane Bates a hat-trick hero. In Division Two, the top two teams both had to work hard for 4-3 wins - March Soccer School against Oundle Town and Leverington against Gunthorpe Harriers Sky. Declan Foster hit three of the Leverington goals to take his tally to 31 for the season.